New Yorkers gathered at the “Fearless Girl” statue on Wall Street on 9 April to salute a true example of a fearless girl, 17-year-old imprisoned Palestinian activist Ahed Tamimi. A group of activists with Samidoun Palestinian Prisoner Solidarity Network gathered with signs and information about Ahed’s case on 9 March, draping the statue with a keffiyeh to represent Ahed. The statue, which faces the Wall Street “bull” of the stock market, is a famous attraction and many tourists and passers-by visit it on a daily basis. 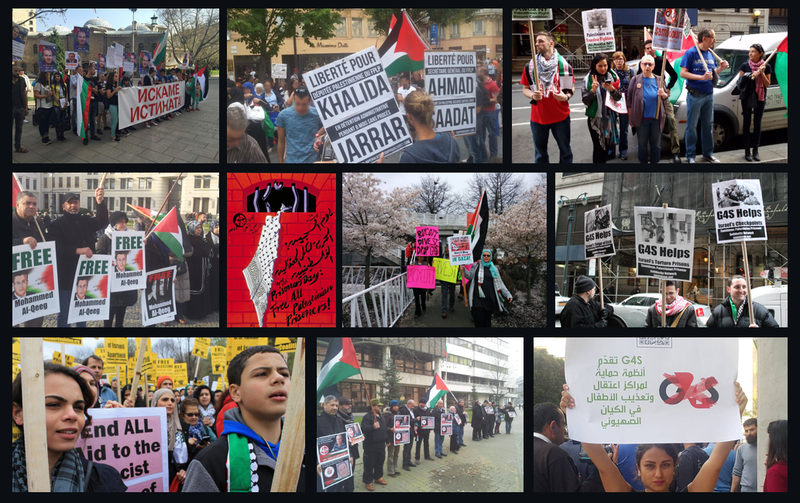 Throughout the two-hour action, participants discussed Ahed’s case with tourists and passers-by, distributing information and posing for photos with visitors to New York, including people from Switzerland, India, Algeria, Japan and several Latin American countries. During that time, only two people expressed displeasure or anti-Palestinian racism – all of the others who saw the statue and engaged with the organizers were interested and supportive. The event came on the same day that Bassem Tamimi, Ahed’s father, held a press conference in Ramallah to reveal a leaked video portion of Ahed’s interrogation by Israeli occupation forces after her arrest in December 2017. Her arrest came in a late-night raid on the family’s home in Nabi Saleh, where they are leaders in the indigenous, anti-colonial land defense movement. The village is a center of organizing; it has been under attack by the illegal Israeli settlement of Halamish, which has confiscated the village’s agricultural lands and even its spring. It followed a widely-publicized video in which she slapped an Israeli occupation soldier, demanding he leave the family’s land. Both she and her mother, Nariman, are currently serving 8-month prison sentences in HaSharon prison; Nariman Tamimi was jailed for streamingthe video of her daughter confronting the occupation soldiers live over Facebook. The video showed a part of over two hours of interrogation on 26 December in the Binyamin detention center in the occupied West Bank. The interrogators in the video are seen attempting to coerce, harass and threaten Ahed throughout the interrogation, who remained silent and spoke only to assert her right to do so. They commented on her appearance and threatened to seize her family members in Nabi Saleh, naming them one by one, if she did not speak and confess. One said that “I don’t want to bring those children here – if you say something, maybe we don’t need to.” Nevertheless, Ahed, 16 at the time, continued to refuse to speak or confess. Ahed’s arrest and that of her mother was noted internationally, and protests and actions took place around the world to highlight their case and demand their freedom as well as that of their fellow 6,500 Palestinian prisoners. In particular, Ahed’s fearless confrontation of the Israeli occupation soldiers and her steadfastness under interrogation captured the imagination of many on a global level.